Mike Lewis / USA Swimming FoundationUSA Swimming set a Guinness record for the world’s largest kickboard earlier this year. Drowning is a leading cause of death for children. An alarming number of children don’t know how to swim or have weak swimming ability. USA Swimming Foundation both supports up-and-coming competitive swimmers and promotes swimming instruction for younger people. Summertime is water time. We head out for the seaside or the lakefront, we hop into rowboats and sailboats and powerboats, and we spend time cooling off at pools. But as much as we love water, the stuff can be dangerous. Particularly for children. I was taught to swim early in life, through frequent lessons at public pools. I’ve been swimming now for over four decades, and although I’ve never encountered anything dangerous, I’ve also enjoyed the confidence that comes from knowing I can handle myself in the water. I have three children, and they have all learned to swim. My daughter is the most capable, but both my sons are able to deal with pools and the ocean. My youngest is still working on his skills, but he’s coming along and he has a healthy respect for water. The bottom line is that while I’m not fanatical about learning to swim, I don’t think anyone who isn’t physically disadvantaged should enter adolescence without being able to float, tread water, and undertake a basic breaststroke or freestyle. I recently had the chance to discuss the issue with some serious swimmers to see what they thought about the topic. 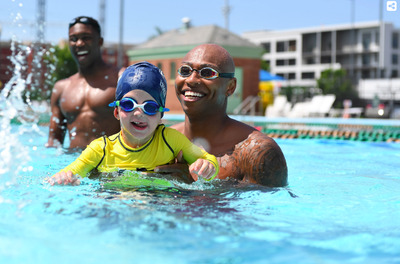 Gaines believes that when a child learns to walk, they should learn to swim. And that’s not just for the kid’s benefit – it can provide parents with peace of mind. 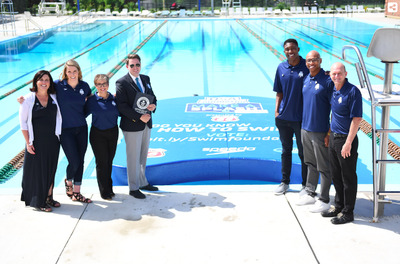 The 59-year-0ld former Olympian and well-known swimming analyst for broadcast TV serves as an ambassador for USA Swimming Foundation. He reminded me that 80% of child drownings happen in front of parents; hot tubs and bathtubs are notoriously dangerous. “There’s a 88% reduction in risk if they take swim lessons,” he said. Mike Lewis / USA Swimming FoundationReece Whitley, rear, and Olympian Cullen Jones with a young swimmer. What starts out as a safety measure can, in Gaines’ case, become a fantastic career. But it call also lead to lifetime of fitness – a full-body workout that’s a noted calorie burner and less stressful on joints than running. I used to play a lot of squash, another noted fitness-booster, but my back and knees ached after an hour on court. So I took to swimming five or ten laps as a sort of therapeutic cool-down, to great success. Gaines told me that there are what he calls “swimming-kid personalities,” so parents shouldn’t get too hung up on whether their child isn’t gliding around like a dolphin right away. I’ve seen the swimming-kid personalities up close. My mermaid-like daughter swims without effort, learned quickly, but doesn’t like to swim laps and has no interest in competition. My older son is more awkward, but he’s been getting stronger in the water as he’s aged. My youngest son in the slow learner, but he knows his limits and has benefitted from one-on-one private lessons. None of my kids are going to follow in Gaines’ wake and pursue aquatic glory. But 18-year-old Reece Whitley is. The 6-foot-9-inch African-American swimmer was a junior standout and is now at the University of California, Berkeley. In February at the Eastern Interscholastic Swimming Championships, he notched a pair of first-places in two different sections, and his has the 2020 Tokyo Olympics in his sights. I talked with him about his life and career as USA Swimming Foundation was kicking off Water Safety Month in May, with some alarming stats in the foreground. Like many kids, Whitley wasn’t an immediate success in the water, but he was determined. Although his rise in junior swimming has been relatively swift – he’s was on the national junior team at age 14 and was named Sports Illustrated Kids’ SportsKid of the Year in 2015 – he admits that he wasn’t that great when he was young and that he only began to accelerate when he turned 13. “We emphasise how important a life skill it is for people of all ages,” he said, a reminder that if you didn’t learned to swim as a kid, it’s never too late. “It’s a life skill and and a survival skill,” he said.